Combining the materials science, technological, and device aspects of organic bioelectronics based on green materials, this is the first overview of the emerging concepts involving fabrication techniques for sustainable electronics with low energy and material consumption. 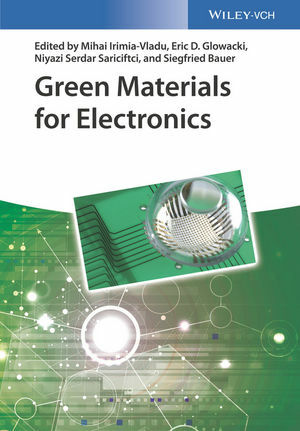 With contributions from top-notch editors and authors, in one focus, the book covers a collection of natural materials suited for electronics applications such as paper, silk, melanin, DNA and nucleobases, resins, gums, saccharides, cellulose, gelatine and peptides. In another thrust, the book focuses on device fabrication based on these materials, including processing aspects, and applications such as sensors, signal transducers, transient, implantable and digestible electronics. With its interdisciplinary approach this text will appeal to the chemistry, physics, materials science, and engineering communities. Mihai Irimia-Vladu is a Senior Scientist at Joanneum Research Forschungsgesellschaft GmbH in Weiz, Austria. Having obtained his PhD at Auburn University, Alabama, USA in the field of Materials Engineering, he spent his post-doctoral tenure at Johannes Kepler University in Linz, Austria. Dr. Mihai Irimia-Vladu is one of the pioneers of the field of biodegradable and biocompatible electronics and has contributed to defining the emerging research field by co-organizing three MRS symposiums on this topic. Eric Daniel Glowacki studied dual degrees in chemistry and history at the University of Rochester, USA, graduating with a BSc and MSc in 2009 and 2010, respectively. He completed his PhD in 2013 at the Johannes Kepler University in Linz, Austria working in the field of nature-inspired semiconducting materials, followed by a postdoctoral stay continuing these topics. In 2015 he was appointed assistant professor in Linz, with research focused on nanoscale organic crystalline materials for bioelectronics. Since 2016 he has been a Senior Lecturer at the Linköping University in Sweden as a Wallenberg Centre for Molecular Medicine fellow. Siegfried Bauer is full professor and head of the Soft Matter Physics department at the Johannes Kepler University Linz, Austria. He obtained his Diploma and PhD degrees from the Technical University of Karlsruhe and subsequently was research scientist and project manager at the Heinrich Hertz Institute for Communications Technology in Berlin. He was assistant professor at the University of Potsdam before moving to the University of Linz. His group's main research areas are soft dielectric materials and organic semiconductors and applications of these materials to flexible and stretchable electronics, sensors and actuators as well as energy harvesting systems. Niyazi Serdar Sariciftci is Ordinarius Professor for Physical Chemistry and the Founding Director of the Linz Institute for Organic Solar Cells (LIOS) at the Johannes Kepler University of Linz, Austria. After his PhD in physics, obtained from the University of Vienna, and a two-year post-doctoral stay at the University of Stuttgart he joined the group of Alan Heeger at the Institute for Polymers and Organic Solids at the University of California, Santa Barbara, USA. Serdar Sariciftci's major contributions are in the fields of photoinduced optical, magnetic resonance and transport phenomena in semiconducting and metallic polymers, being the inventor of conjugated polymer and fullerene-based bulk heterojunction solar cells.